The last of the Navajo Code Talkers, Chester Nez, has died at the age of 93. The language he once was punished for speaking in school became Chester Nez's primary weapon in World War II. 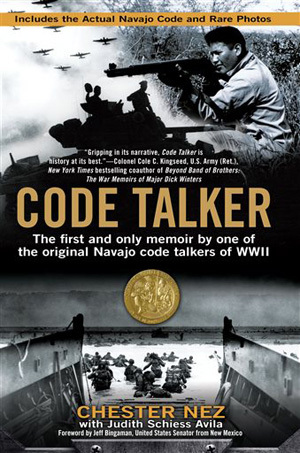 Before hundreds of men from the Navajo Nation became Code Talkers, Nez and 28 others were recruited to develop a code based on the then-unwritten Navajo language. Locked in a room for 13 weeks, they came up with an initial glossary of more than 200 terms using Navajo words for red soil, war chief, braided hair and hummingbird, for example, and an alphabet. Nez never tired of telling the story to highlight his pride in having served his country and stress the importance of preserving the Navajo language. The 93-year-old died Wednesday morning of kidney failure with plenty of appearances still scheduled, said Judith Avila, who helped Nez publish his memoirs. He was the last of the original group of 29 Navajo Code Talkers. "It's one of the greatest parts of history that we used our own native language during World War II," Nez told The Associated Press in 2009. "We're very proud of it." Navajo President Ben Shelly ordered flags lowered across the reservation in honor of Nez from sunrise Thursday to sunset Sunday. Nez was in 10th grade when he lied about his age to enlist in the U.S. Marine Corps not knowing he would become part of an elite group of Code Talkers. He wondered whether the code would work since the Japanese were skilled code breakers. Few non-Navajos spoke the Navajo language, and even those who did couldn't decipher the code. It proved impenetrable. The Navajos trained in radio communications were walking copies of it. Each message read aloud by a Code Talker immediately was destroyed. "The Japanese did everything in their power to break the code but they never did," Nez said in the AP interview. Nez grew up speaking only Navajo in Two Wells, New Mexico, on the eastern side of the Navajo Nation. He gained English as a second language while attending boarding school, where he had his mouth washed out with soap for speaking Navajo. When a Marine recruiter came looking for young Navajos who were fluent in Navajo and English to serve in World War II, Nez said he told his roommate "let's try it out." The dress uniforms caught his attention, too. "They were so pretty," Nez said. About 250 Navajos showed up at Fort Defiance, then a U.S. Army base. 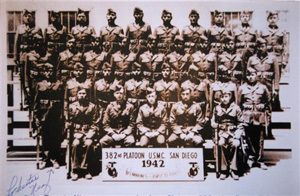 But only 29 were selected to join the first all-Native American unit of Marines. They were inducted in May 1942 and became the 382nd Platoon tasked with developing the code. At the time, Navajos weren't even allowed to vote. After World War II, Nez volunteered to serve two more years during the Korean War. He retired in 1974 after a 25-year career as a painter at the Veterans Affairs hospital in Albuquerque. His artwork featuring 12 Navajo holy people was on display at the hospital. For years, Nez's family and friends knew only that he fought the Japanese during World War II. Nez was eager to tell his family more about his role as a Code Talker, Avila said, but he couldn't. Their mission wasn't declassified until 1968. The accolades came much later. The original group received Congressional Gold Medals in 2001 and Nez often joked about pawning his. He measured the accuracy of the movie "Windtalkers," based on the Code Talkers that came out the following year, at 78 percent and said the Navajo spoken by Adam Beach was hard to understand but "he tried his best." Code Talkers have appeared on television and at parades and they are routinely asked to speak to veterans groups and students. They are celebrated on the Navajo Nation with a tribal holiday. Nez threw the opening pitch at a 2004 Major League Baseball game and offered a blessing for the presidential campaign of John Kerry. In 2012, he received a bachelor's degree from the University of Kansas, where he abandoned his studies in fine arts decades ago after tuition assistance he received for his military service ran out. U.S. Sens. Tom Udall and Martin Heinrich, and Rep. Ben Ray Lujan, of New Mexico, praised Nez for his bravery and service to the United States in a statement Wednesday. The Code Talkers took part in every assault the Marines conducted in the Pacific, sending thousands of messages without error on Japanese troop movements and battlefield tactics. Once while running a message, Nez and his partner were mistaken for Japanese soldiers and were threatened at gunpoint until a Marine lieutenant cleared up the confusion. He was forbidden from saying he was a Code Talker. "He loved his culture and his country, and when called, he fought to protect both," Udall said. "And because of his service, we enjoy freedoms that have stood the test of time." Despite having both legs partially amputated, confining him to a wheelchair, Avila said the humble Nez loved to travel and tell his story. "It really was a good thing, such a good experience for him," she said. "He said he would do it over again if his country needed him." A public viewing is scheduled Monday evening in Albuquerque. A Mass is scheduled Tuesday in Albuquerque, with burial to follow at the Santa Fe National Cemetery in Santa Fe, New Mexico.